I consider myself very fortunate as an artist and just plain living/breathing human being to have laid down roots in St. Petersburg, Florida. This is the last stop for my partner and I on our 18 year journey down the east coast of the US. I know, I know...never say never, but this time we really mean it. This city (which often feels like a small town) has everything we were after. Thriving culture, diversity, a strong sense of community and of course, no harsh winters. As an artist who works in a non-traditional style that has been well received only by niche markets in the more conservative places we've lived in, St. Pete feels like home. The art scene is as diverse as its residents. Anything goes! So now that I am finally home, I've decided to turn this blog in the direction of highlighting what the Tampa Bay art scene has to offer and why it is a true arts destination to be reckoned with. Yesterday I had the pleasure of visiting Portspace Gallery in Gulfport, a quaint and charming bayside community. Portspace recently won Creative Loafing's Best of the Bay award for Best New Gallery. I was treated to a private tour by artist Sue Woodall, whose From There to Here, From Here to There is currently on exhibit. We had a lovely chat. JG: How did you get started as an artist? SW: I can never remember not being an artist. As a kid I made things all the time, doodled in class instead of writing and over time just naturally gradated to more and more art lessons and classes throughout my schooling. I painted a lot of oil paintings. Eventually my art teacher in high school suggested I apply to be part of an advanced art program my senior year at another school. I applied, got in and that class was the best thing for me because it taught me new mediums & methods that I hadn't been exposed to yet and also allowed me to create a portfolio to enter college. I grew up in a very small town in Md, was very isolated and knew nothing about art careers so my first instinct was that I would become an art teacher. I went to More College of Art where I studied fine art and eventually pursued graphic design. After 25+ years as a successful graphic designer & art director, I am now concentrating on pursuing my fine arts roots again. All I want to do is make art with my hands and not touch a computer. SW: I call what I do mixed media because I don't always paint in a traditional sense and my art builds throughout my process. Way before I even knew the term, I was painting and adding collage layers, bits of recycled items and experimenting with different mediums in one piece against everything I had been taught. Then one day I saw some art labeled mixed media and realized it was what I was doing. I love mixed media because I just create with everything I can get my hands on to get what I want. JG: What inspires you, currently? 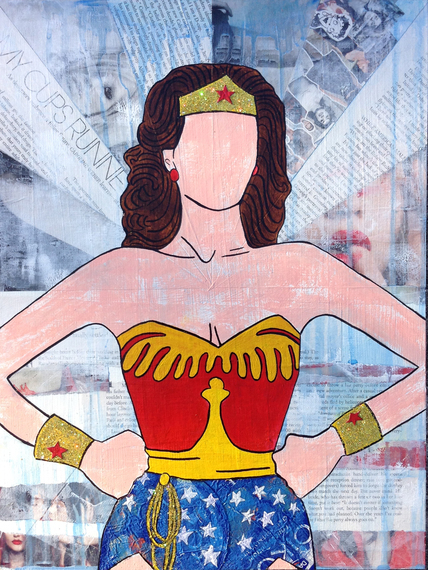 SW: Last year I was creating mostly pop art styles like Insert Face Here aka Wonder Woman and Boogie Nights and I was doing a lot of local shows that had certain themes. Being a part of local group shows got me out of my box and into territories with my art that I may have not ventured. Its very inspirational to be in a show with other artists and their unique styles. My work this year went into more of an abstract direction and I added encaustic wax to my process. I am inspired by pop culture, nature, color, texture and who knows - I find inspiration where I least expect to find it. I could be walking down the street and suddenly stop to look at a drainage cover or weed growing on a heavily rusted over wall and I'm drawn to the texture and decay. I am drawn to old historic buildings that are dilapidated and falling down than brand new sky scrapers. JG: What is sitting on your easel right now? SW: I have a bunch of works in progress. I have two 18 x 24 oil & encaustic paintings on my easel breathing and waiting for me to make the next move. One piece is part of a collaboration with St Pete glass artist Josh Poll for an upcoming local show and is a surprise. The other piece is an abstract waterscape where I incorporated printed labels into the design. I also have some small watercolor abstracts that I have been experimenting with cutting apart and sewing into a much larger piece. I will soon have my Dr Seuss dress back from the show at Portspace to do a few minor repairs and to build a train for the back of the skirt. Its going to be modeled again on November 11 for Trashy Flashy Fashion Show with Keep Tamp Bay Beautiful. JG: Tell us a bit about your creative process. SW: Doing my pop art, I usually start with a series sketches or thumbnails with some notes about color, texture, elements, etc. I sometimes do a mini version of the piece just to mess with the medium and see the results. I then start with adding layers and paint to create texture and then I will begin the painting on the top layer. My encaustic work is a pretty much the same way except that I am working in oils and layering in wax. Now thats its cooling off, I am going to back at the encaustic again from inside my hot garage. JG: Do you have a favorite artist or painting? SW: One of my favorite artists of all time is Henri Matisse. I love his use of color, pattern, collage and the fluidness of his images. The Purple Robe is probably my most favorite work that he did. I also really love the Jazz series of cut-outs that he created when he could no longer paint and could only use scissors from his bed. I read that he created these huge collages that were so big that they became murals and filled his hospital room. 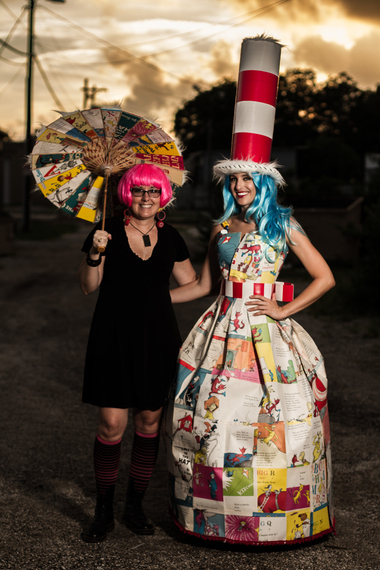 Mixed media artist Sue Woodall (left) strikes a pose with a model and her Dr. Seuss Dress. Photo by Joseph Siciliano. JG: What is your favorite part about being an artist in St. Pete, Florida? SW: I am really happy to be living in St Pete, we really have the best of everything with all the beaches all around us and downtown. I love the energy and mixture of artistic styles that reside in St Pete. There are traditional styles hanging next to non-traditional works in the same gallery and then you walk out the door and there are murals & graffiti images on the buildings. One can't help but be inspired every time you go downtown. I love that we still have a some old original buildings downtown and brick streets. Its good that St Pete is very open to all types of art which is not always the case in where you live.